I am hesitant about sharing today's card, but in the end, I guess I would.... share! You see, it's a Pot Luck Card-- these are things/pieces are left on my craft desk. It all started out with the yellow and blue watercolor piece. I love the die "Sunshine". After I made the diecut "sunshine", I decided to leave it as is. Well, that is something different, huh? A sweet blog friend Coni suggested to call this type of cards as "Pot Luck Carda". How aptly named! Whatever they are on the table will make a CARD! Here's a Craftsy class that I recommend that you check it out. I thought I knew enough about watercoloring, but there is so much to learn! My friend Deepti teaches you how to work with different kinds of paint brushes and how to make it work with different strokes! And that is just lesson #1! And did you know that there is a new class? It is taught by the uber talented Shari Carroll! FYI: I am having a giveaway, please check the top right side bar or click here to enter if you have not done so already. You did a great job on this Virginia. I too love to use those pieces on my desk. I hate to waste perfectly good "left overs". They may not have been right for the original project but that doesn't necessarily mean they aren't any good! I'm glad you shared!...This is AWESOME!! Love it! Darn, you're so good at putting these disparate elements together in a kind of collage-y effect. 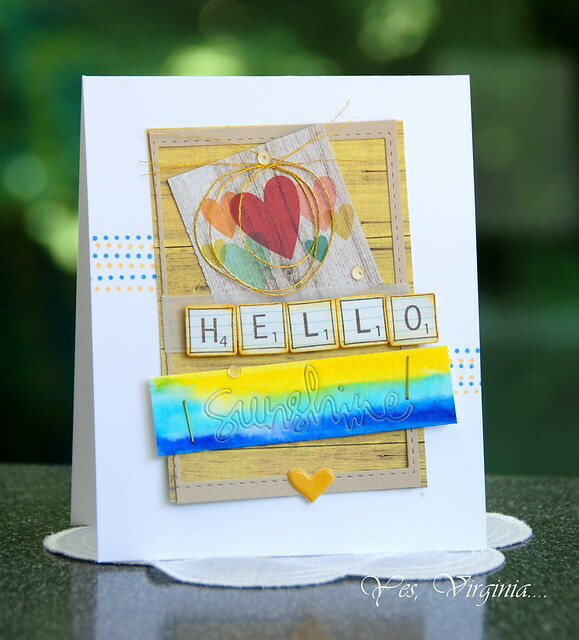 Your choice to leave the "sunshine" die in the negative space really adds alot of color and fun to the card. BTW, thanks for the "pot luck" shout out, you're such a sweetie. I am thrilled that you shared this card with us - what a fabulous idea - Pot Luck Cards!!! So very fun and a great ray to use up all the "this and thats" on your table that have accumulated there!! Always thinking so smart!! This card is very wonderful and I love the sunshine word element on this card - it dazzles!! Your "potluck" looks great! Everything fits together in a happy way! A Pot Luck Card!! That is better then a "mess on my desk" card, which I often make. I LOVE this fun card. I really like the way you made the sunshine sentiment with the inks. Really pretty!! Well done putting your bits and pieces together and ending up with an awesome card Virginia. Wonderful card, love the layers! This is just so happy!! Love what you came up with! Such a great mix of papers, stamps and dies, well done!